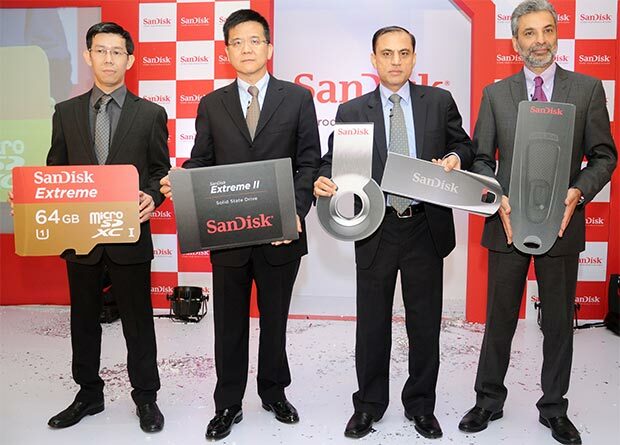 SanDisk yesterday introduced new products for the Indian market. The products include a fast SanDisk Extreme II SSD, Extreme microSDHC/microSDXC UHS-I cards and a Ultra USB 3.0 flash drive. The Extreme II SSD features a 19nm flash memory and coupled with SanDisk’s nCache acceleration technology, the SSD delivers a sequential read speed of up to 550MB/s and write speed of up to 510MB/s. The SSDs will come in capacities of 120GB, 240GB and 480GB for Rs. 14,750, Rs. 26,100 and Rs. 49,500 respectively. The Extreme microSDHC and microSDXC UHS-I cards are targeted at smartphone and camera users. The cards offer both UHS Speed Class 1 and Class 10 video recording and gives speeds of up to 80MB/s (read) and 50MB/s write speed. The cards will come in capacities ranging from 16GB to 64GB at a price range from Rs. 2,275 to Rs. 8,000. The Ultra USB 3.0 flash drive supports the latest and the fastest USB interface that boasts transfer speeds of up to 80MB/s and comes from 16GB to 64GB at a price from Rs. 1,250 to Rs. 4,950.